Meryl Streep "Because the connection in music to your emotional center is direct." The Washington Post, December 24, 2014 interview on singing Sondheim. in which we express feelings when we have no words, a way for us to understand things with our hearts when we can't with our minds." Director of the Music Division of the Boston Conservatory, 2002-2013..
﻿﻿ ﻿Plato (c.427 bce - c.346 bce) ﻿"Musical training is a more potent instrument than any other, because rhythm and harmony find their way into the secret places of the soul." ﻿﻿ ﻿Daniel Levitin, McGill University, ﻿runs a neuroscience lab on music, cognition and expertise. In an opinion column for the NY Times about the attentional system of the brain, he observed: "Music, for example, turns out to be an effective method for improving attention, building up self-confidence, social skills and a sense of engagement." "Hit the Reset Button in Your Brain", NY Times, August 9, 2014. ﻿Nick Stewart, Oxford Brookes University﻿ Singing in a choir can be good for our psychological well-being. That is the conclusion of research being presented at the Annual Conference of the British Psychological Society's Division of Clinical Psychology (DCP) in York. Nick Stewart set up an online study asking 375 people who sang in choirs, sang alone or were members of sports teams about their experience of these activities. All three leisure activities yielded high levels of well-being, but the results revealed statistically significant evidence of higher reported well-being in people who sang with a choir compared to those who sang alone. Choral singers reported seeing their choirs as more coherent or 'meaningful' social groups than the sportsmen and women saw their sports teams. Nick Stewart says: "Research has already suggested that joining a choir could be a cost-effective way to improve people's well-being. Yet we know surprisingly little about how the well-being effects of choral singing are brought about. These findings suggest that the experience of using your voice to make music may be enhanced when you feel part of a cohesive social group. Further research could look at how moving and breathing in synchrony with others might be responsible for creating a unique well-being effect." British Psychological Society (BPS), December 4, 2013. “Why singing in a choir is good for you”. ScienceDaily. 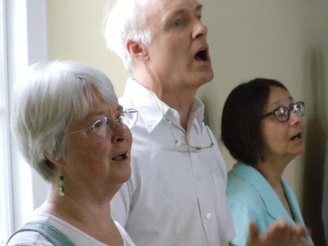 ﻿Professor Steven Clift, music and health expert ﻿ "There's no doubt that singing makes us happy. It's incredibly engaging and we get instant positive feedback. People often report their stress draining away, in fact an accurate interpretation of how it affects us physiologically. Research shows that levels of the stress hormone cortisol decrease when we sing, lowering our heart rate and relaxing us. Interestingly, another hormone found to rise when we sing in choirs is oxytocin, associated with pregnancy and labour, and found to peak in fathers present at the birth of their children. The oxytocin underpins our ability to form bonds, which explains that sense of connection when we sing en masse. ﻿The Daily Telegraph﻿ "Singing is a great way to work out - it's an aerobic exercise that increases oxygen levels in the blood without leaving you hot and sweaty. Singing makes you look good - it improves posture and tones tummy muscles. Singing reduces stress levels and blood pressure. It's very hard to worry and sing simultaneously!" ﻿Minnesota Public Radio ﻿ "Americans like to think of themselves as folks involved in their communities, who give back and are good sports about it. A Chorus America study shows that these attributes are particularly pronounced in American choral singers. Choral singers are more likely to vote, give money to philanthropies, and also to volunteer; they're the kind of people you want on your team. These civic-minded, socially adept folks are in enormous numbers in the U.S. Some 32.5 million adults sing in 270,000 choruses. What draws people to singing -- beyond the sheer artistic experience and communal expression -- is partly the accessibility of singing. There are few economic or educational barriers. And a singer need not possess the level of skill of an instrumentalist to still feel like a contributor to the creation of art. What a singer gets in return is an intangible mix of pride and joy. But this particular study has found that singers in choruses also develop positive attributes that can be measured. Greater civic involvement, discipline, teamwork, increased social skills, volunteerism, philanthropy, and support of other art forms are some of the very tangible qualities that increase when a person sings in a chorus." ﻿Community Music Victoria ﻿ "In a society that worships experts, excellence and consumption, we've forgotten that the most valuable aspect of music is actually making it. There's nothing wrong with concert-going or CD-buying, but it’s through actively making music that the most profound joys and fulfillment can be found. Music-making needs no audience. Indeed, it is the participants rather than the listeners who reap the most significant benefits. Contemporary western society has only recently forgotten this truth. . . . When people make music together, connections develop. These connections can transcend profound difference, create unexpected unity, and bring cathartic joy which extends into everyday life. Through creative practices, we discover and develop connections that join our collective beings in imaginative and intuitive ways which transcend rationality. We often use the term “harmonious” as a description of the society we aspire to live in. This is no accident. Our bodies respond physically, sensually and emotionally to harmony - the connections between sounds moves us. Making harmony in the moment is a joyful and up-lifting experience - a tangible manifestation of our dreams of oneness through diversity. But most importantly, making music together is fun, and in the context of a culture which demands instant gratification, we’re pleasantly surprised to learn community music-making is immediately fun. In the case of singing, through using just the body and voice people can discover, explore and celebrate their creative capacities in ways which no other activity can offer so easily, accessibly, inclusively, and (possibly most importantly) with such immediate gratification."